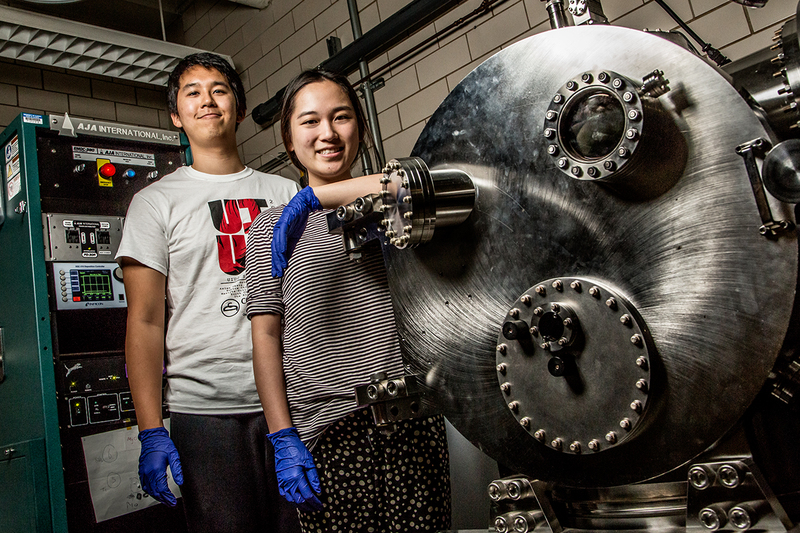 Jonas Kurniawan and Simone Heo received hands-on experience and equipment training as undergraduate researchers in professor John Rogers’ lab. Heo, from Northbrook, Illinois, accomplished all of this as an undergraduate researcher in the lab of materials science and engineering professor John A. Rogers. While faculty, graduate and postdoctoral researchers contribute greatly to the research excellence that the campus is known for, the U. of I. also offers many opportunities for undergraduate students to be involved in research. The Rogers group is one of the largest, with 20 to 40 or more undergraduate members each semester. Rogers, a Swanlund Chair and the director of the Frederick Seitz Materials Research Laboratory, is a globally renowned pioneer of stretchable, flexible electronic devices. From stick-on medical monitors to less-invasive surgical tools to higher efficiency solar arrays, his lab produces a variety of innovative new devices and techniques for making them. For Rogers, undergraduate research has a special priority. Rogers’ group includes students from a variety of science and engineering majors, providing opportunities for students not only to apply skills learned in their respective classes but also to collaborate across disciplines. It also exposes students to applied theories and specialized techniques developed in the Rogers lab as they work to integrate solid electronics with soft tissues and flexible surfaces. Exposure to lab procedures and equipment training not only gives students valuable hands-on experience beyond their coursework, it also hones skills to help them succeed when they enter the workforce or enroll in graduate studies. undergraduates to use the equipment and walk them through the research process. career path they pursue after graduation. Jonas Kurniawan, a materials science and engineering student originally from Jakarta, said he has learned perseverance, teamwork, time management, integrity and entrepreneurship through his time with the Rogers group. Kurniawan is nurturing twin passions for engineering and entrepreneurship. Such statements echo the experience of Rogers himself.